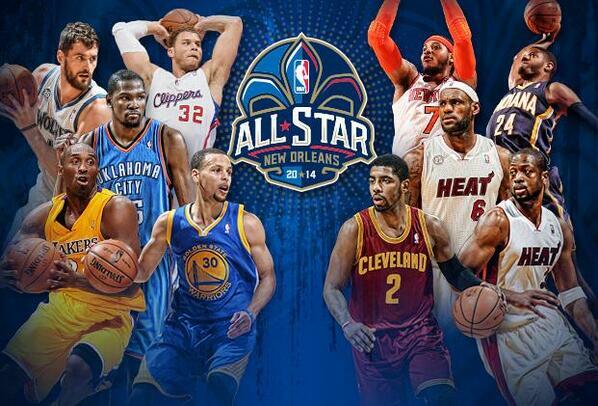 And here is a rundown of your 2014 NBA All-star teams. Stephen Curry, Kevin Love, Paul George and Kyrie Irvinghave all been voted NBA All-Stars, putting four first-time starters in the Feb. 16 game in New Orleans. Kobe Bryant was elected by fans to his 16th All-Star Game, second-most in NBA history, but this one is shaping up as a kids’ game. Curry, perhaps the biggest snub last season, will join him in the Western Conference backcourt. Love passed Dwight Howard in the final days of voting and will start in the frontcourt along with Oklahoma City’s Kevin Durant and the Clippers’ Blake Griffin. LeBron James was the leading vote-getter with 1.4 million votes and Miami teammate Dwyane Wade was also voted in Thursday. George, who has led Indiana to the league’s best record, and New York’s Carmelo Anthony are the other East forwards, and Irving will start at guard.